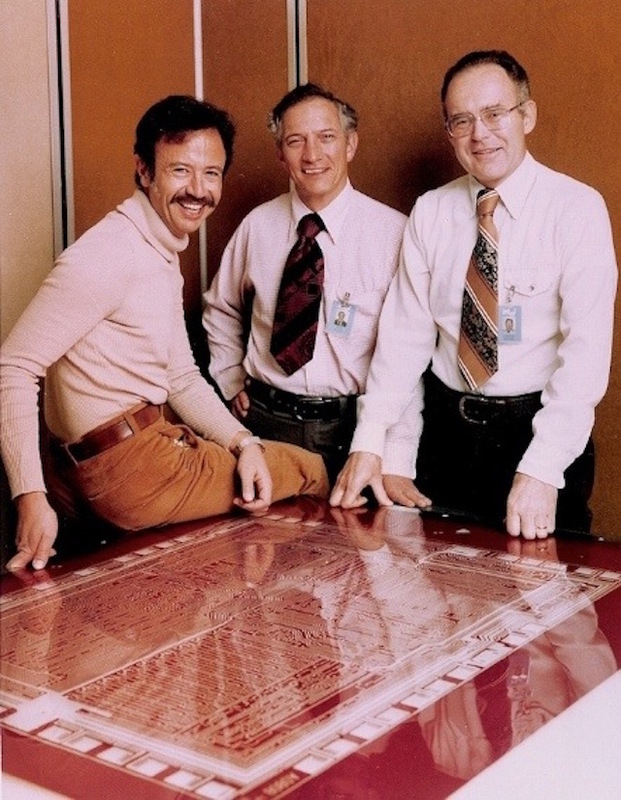 1978: Andy Grove, left, with Intel colleagues Robert Noyce (center) and Gordon Moore. Intel yesterday announced that Andrew Grove, its former CEO and Chairman, had died aged 79. Present at Intel’s 1968 founding with Robert Noyce and Gordon Moore, Andy Grove became Intel’s President in 1979 and CEO in 1987. He served as Chairman of the Board from 1997 to 2005. Both during his time at Intel and in retirement, Grove was one of the most influential figures in technology and business, writing best-selling books and widely cited articles, and speaking out on an array of prominent public issues. I met several times with Andy Grove when I worked at the Financial Times and became a great admirer of his work at Intel. 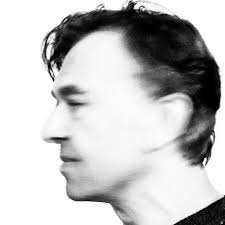 Grove was looking very frail. He was diagnosed with Parkinson’s Disease in 2000 and has made large charitable contributions to medical research. 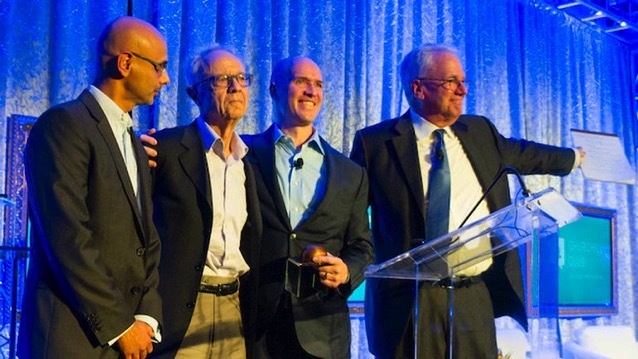 At Churchill Club 2015 :From left: Saleem Janmohamed; Andy Grove, Ben Horowitz and Geoffrey Moore. Grove was the main driving force within Intel since it’s founding in 1968. He created a “Marine Corps” culture encouraging frank, open discussions along with a management style that relied on a lot of shouting (he was partially deaf). It was an effective management style because Intel grew to become one of the most valuable public companies in the world, the world’s largest chip maker, and has created huge returns to shareholders for decades by dominating markets for microprocessors — the most profitable chip device category. After he retired from CEO and then later as Chairman, he remained as a special advisor to Intel. He has worked very hard over the past ten years to make sure Intel became a model of corporate governance. He helped recruit a diverse board of directors (below) and insisted on a separation of CEO, President and Chairman positions. Many tech companies allow their CEOs to also be President and Chairman. Intel’s board of directors earned a perfect score from GovernanceMetrics International. Only 21 other company boards have received this recognition. 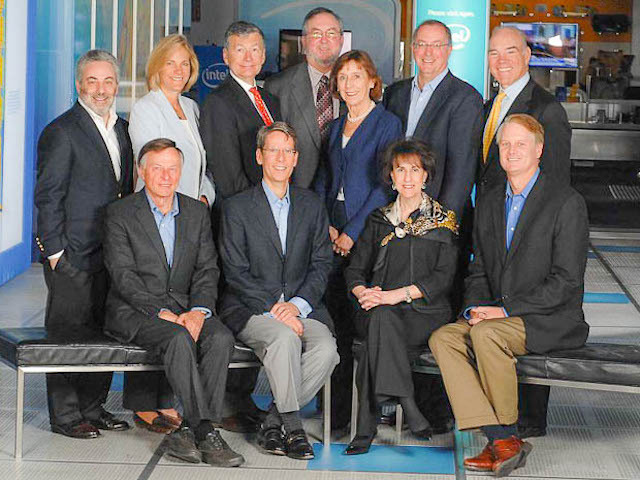 Above: Intel’s Board of Directors in 2013. Grove’s influence and focus on diversity led to the appointment in May 2013 of Renée James (below) as President, essentially a co-CEO position with Brian Krzanich. Ms. James worked as Technical Assistant (TA) to Mr Grove for four years. The position of TA to the CEO is a traditional fast-track path for senior Intel executives. Ms. James left Intel in January 2016. Former Intel President Renée James. The culture Grove helped create at Intel can be a harsh one but it is also intensely loyal. I have made many friends at Intel over the past 30 years and the extraordinary thing is that nearly all are still there. This is rare in Silicon Valley and it is a testament to Intel that a confrontational culture in the workplace doesn’t prevent strong bonds of loyalty and cooperation inside its teams. Andy Grove’s legacy is immense and his influence in Silicon Valley and beyond has been extraordinary.